Formerly the local provost's property consisting of the old 16th century oil mill and an 18th century bastide, with orchards, kitchen garden and fields with cart-horses, donkeys, geese, ducks... Charming rooms, very comfortable, furnished with family and local antiques. For your wellbeing, a swimming pool, sauna and jacuzzi. Generous breakfasts with homemade pastries, bread, jams and fruit salads and carefully-sourced local produce. Warm welcome, attentive to guests' needs. 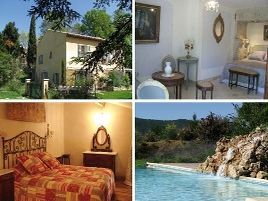 A real haven of peace and quiet in the heart of the Maures hills..
2 suites and 2 rooms with bath or shower and WC. Depending on the season and the room, from 120 to 170 euros (2 pers.). Extra bed 25 euros (+ 15 yo). The closest station is Pignans, located at 1 km. The closest airport is Toulon-Hyères, to 30 km.